The best daypacks for women fit our unique contours. But the best women's day packs don't compress our soft tissues or dig into our curves. Thankfully, the best backpack manufacturers are doing everything right in that department, PLUS providing lots of useful features to earn a place in the "best daypacks for women" Hall of Fame. And then look at how to size up a womens day pack so it fits you like your own skin. Every hiker has a short list of go-to gear. I am a huge fan of Osprey and Deuter packs, having owned more than one of each for many years (thousands of trail miles). I heartily recommend this pack as one of the best daypacks for women currently available. If you'd prefer a daypack which can also be pressed into service for overnight trips or more rugged day hikes, try the Osprey Sirrus 36. Deuter packs are also worth a close look, with all of the features mentioned above to keep you comfortable on the trail. This ACT Trail 28 SL Pack is great for day hiking. The fit of the hip belt is particularly good for a curvy female body. Look for REI Co-op deals on day packs as you're building your hiking gear shopping list, and note the free shipping and generous return policy. Not a member? Read about all of the generous member rewards here. Now let's get to the backpack selection tips you'll need. That's just a fancy way of saying that day packs for women, a critical piece of hiking gear, must stand up to the sweat, mud and debris of the trail. They should be designed to function well under all temperature and moisture conditions. AND they are built to handle curves. That doesn't sound so hard to achieve, does it? Just because a gear manufacturer has slapped a "womens" label on a day pack doesn't guarantee that it will fit well while providing good service on the trail. That's why Osprey and Deuter are at the top of the list! 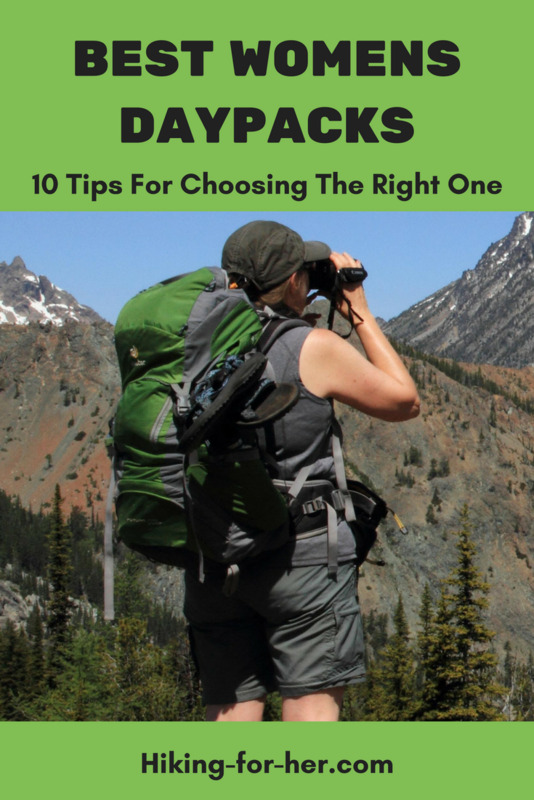 Now that you know which brands of packs to look at, use the following tips to make sure the backpack you select fits you perfectly, and works well for your hiking style. A classic mistake in choosing a backpack is to invest in a daypack that is the wrong size for your needs. Too big, forcing you to wear a pack that literally rubs you the wrong way. Or too small, forcing you to buy a bigger pack once you realize that what you want to carry on a hike is not going to fit into such a small daypack. Backpacks don't have small-medium-large sizes like hiking clothing does. Instead, pay attention to the number of liters. This information may be part of the name, as in Best Daypack30. Reasonable numbers for a daypack: 36 liters to 22 liters. If you're shopping for a multi-purpose day pack, look at the smaller end of the spectrum. 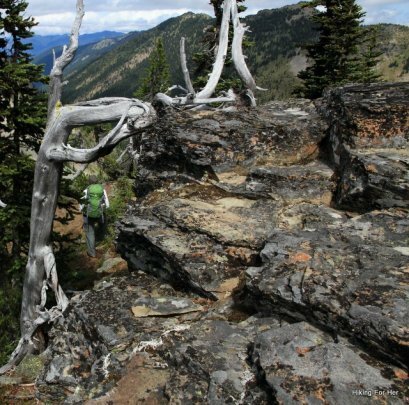 carrying hiking gear on easy to moderate day hikes. If you're looking for a woman's hiking daypack that can also be used for short, lightweight backpacking trips or more aggressive day hikes, go to the higher end of the liter scale. Some daypacks also have torso length descriptive words, such as "shorter". Others will feature an adjustable torso length. You might want an adjustable pack, if you want to share it or are looking for a daypack that fits a growing teenager. But guess what happens to the price point as you gain these adjustment features. Is color really a feature? Yes, because it evokes a subconscious response in you every time you glance at it. If the day pack color is one that you feel in tune with, you might feel more kindly disposed toward hiking. This can be important motivation for a beginner hiker. So the best daypacks for women are made in a range of colors which put you in mind of the great outdoors. One of my pet peeves is vividly colored day glow gear which distracts from the outdoor experience. The best daypacks for women blend in with Mother Nature! And to play devil's advocate, the color of your day pack can work to keep you found, as with a bright color that can be spotted from a rescue helicopter. Bright is not bad, in other words. Especially during hunting season. A good daypack will be engineered to sit on your back with a mesh "wall" and plenty of airspace between your sweaty shirt and the pack itself. Some brands of packs use a particular word for a ventilation system to set it apart from competitors. Be sure you watch for this mesh panel ventilation feature as an indicator of the best daypacks for women. a larger one that's easy to get into for retrieving your jacket and lunch. Is this belt really necessary on a day pack for hiking? Yes, if you're carrying more than a lightweight jacket and a granola bar. This belt will distribute the weight of your pack across your hips, which is the best place for it and one of the best uses for those womanly hips. So skip packs without a belt. Not too wide, but widely adjustable to accommodate my multiple clothing changes in a day? (to accommodate the quickly changing mountain weather, right?) Check. Lightweight but sturdy, replaceable buckles? Check. Who needs really wide gizmos on a day pack? Not humans with breast tissue! Look for adjustable shoulder straps and sternum belt (which clips across your chest above your breasts) which fit the contours of your body. This is where a lot of individual variation exists, and is one of the main reasons you should try on a lot of different brands and styles of the best daypacks for women. Lightweight plastic zippers on the daypack compartments are the norm. They don't snag or break easily. Although it is possible to jam them if you aren't careful, so always devote your full attention to the zip/unzip cycle. Most zippers will be equipped with fabric pulls (tabs) to make using them one handed, or wearing gloves, an easy maneuver. A nice feature you might run into: brightly color coordinated tabs, making them easy to see against the bulk of the day pack. A fabric overhang built into the daypack's zipper contours, to shield the zipper from moisture & trail dirt, thus protecting the contents of your day pack while extending the life of the pack. Look for at least one, to hold a water bottle, maps, or hiking clothing that comes off and on throughout the day hike (gloves, sunglasses, hat). If you know that you'll be carrying unused hiking poles or a camera tripod for portions of your hike, you want a strap above the mesh pocket that can be lashed down tightly after it buckles around your hiking gear. Having 2 mesh side pockets on a daypack is ideal for longer dayhikes requiring two water bottles or additional gear. A rain cover pocket at the very bottom of the pack, with a bit of wiggle room to store a hat and gloves. Even better if the day pack comes with its own custom fitted rain cover, as Deuter (see below) day packs do. Zippered mesh hip belt pockets are handy for storing hard candy, car keys and lip balm. A small zippered pocket on one of the shoulder straps works well for small navigational aids that are taken out frequently. Why take off your pack every single time, right? You can buy cheap daypacks, and if you're a day hiker who hits the trail only under ideal conditions several times a year, these will work for you. But most women who are really into hiking will want a day pack that fits well and feels feather light in all conditions. And because hiking is a low cost sport, it makes sense to invest in a few high quality items to make your trail time comfortable, fun and safe. And on that short list is your daypack. You've just looked at 9 features which best daypacks for women will have. Ask yourself which ones you're willing to skip. If the answer is "none", you'll be looking at the higher end of the price range for a daypack. So what is a reasonable price for a fully loaded daypack? Somewhere around $100 - $150 U.S.
For this amount of money, you can expect durable materials and an assurance that if there is a defect in the pack, you can return it. the best daypacks for women! If you're old enough to remember the TV commercial which declared "You've come a long way, baby! ", you will share my joy over a daypack that actually fits your woman's body. Because women's hiking gear has indeed come a long way since I started backpacking in 1971. These days, the best day packs for women are DESIGNED for a woman's contours. Who'd a thunk it? Lots more day hiking tips for you here. 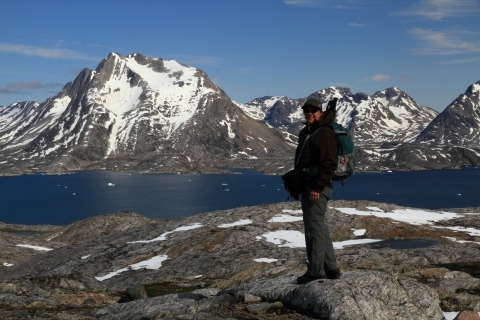 Enjoying East Greenland hiking in one of the best daypacks for women. 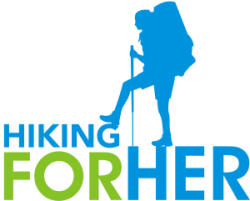 If you use this link to shop at REI, Hiking For Her will receive a small percentage of your purchase price. Yet you pay nothing extra for your great gear while helping HFH to share the best free hiking tips. Nice win-win, don't you think? P.S. I've been an REI member since 1977, and have never had a problem with their policies or products. They're the real deal!